This excerpt is a bit longer that what I am accustomed to posting here, but it is worthwhile. 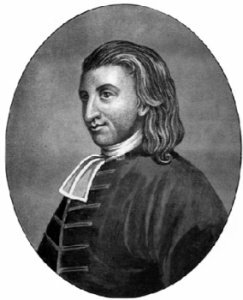 In his commentary on Ecclesiastes, Philip Graham Ryken provides a brief biography of the great Puritan Thomas Boston. He then discusses his life in light of his classic sermon, “The Crook in the Lot” which was prepared shortly before his death. For anyone suffering the frustration of life in a fallen world, this will encourage your heart. It also highlights the difference between the despair of fatalism and the hope that is found in the Sovereignty of a God who is working all things together for our good. “Thomas Boston was a melancholy man, prone to seasons of discouragement in the Christian life. He was often in poor health, even though he never missed his turn in the pulpit. His wife suffered from chronic illness of the body and perhaps also the mind. But perhaps the couple’s greatest trial was the death of their children: they lost six of their ten babies. After suffering such a heavy loss, many people would be tempted to accuse God of wrongdoing, or to abandon their faith, or at least to drop out of ministry for a while. But that is not what Thomas Boston did. He believed in the goodness as well as in the sovereignty of God. So rather than turning away from the Lord in his time of trial, he turned toward the Lord for help and comfort. Here the Preacher invites us to consider God’s work in the world. Then he asks a rhetorical question: Who has the power to straighten out what God has made crooked? The answer, of course, is no one. Things are the way God wants them to be; we do not have the ability to overrule the Almighty. When the Preacher talks about something “crooked,” he is not referring to something that is morally out of line, as if God could ever be the author of evil. Instead he is talking about some trouble or difficulty in life we wish we could change but cannot alter. This happens to all of us. We struggle with the physical limitations of our bodies. We suffer the breakdown of personal or family relationships. We have something that we wish we did not have or do not have something that we wish we did. Sooner or later there is something in life that we wish to God had a different shape to it. What is the one thing that you would change in your life, if you had the power to change it? In that train or course of events, some fall out cross to us, and against the grain; and these make the crook in our lot. While we are here, there will be cross events, as well as agreeable ones, in our lot and condition. Sometimes things are softly and agreeably gliding on; but, by and by, there is some incident which alters that course, grates us, and pains us.… Every body’s lot in this world has some crook in it.… There is no perfection here, no lot out of heaven without a crook. When some people hear Ecclesiastes say this, they assume that the Preacher is being fatalistic. Some things are straight in life, other things are crooked; but whether they are crooked or straight, there is absolutely nothing that we can do about it. It all comes down to fate, or maybe predestination. Therefore, this passage is about “the powerlessness of human beings over against God”—a powerlessness that can only lead to fatalism. Click here to read Thomas Boston’s The Crook in the Lot in it’s entirety. This was a perfect and providential read for today, Christina. We actually have this Boston book sitting on our shelf. You’ve definitely encouraged me to go pick it up. Love you, sister. Thanks for that sis…. it was an encouragement for me today…. May the Lord richly bless you and yours! Christina, Thank you for this beautiful encouragement today. After so many losses last year, through which God taught me much about contentment, I found it so encouraging to read the Puritans. They knew such heartache. How well they lived out what they believed. Praise God for not giving us up to ourselves and our wants and wishes! Where would I be? The theme all through that book is, that it’s not our crosses or afflictions that need to change but our hearts in our crosses or affliction. Thanks for sharing this. I have Boston’s book but have not read it yet. This gives me even more reason to. I was very encouraged in reading this today. Thank you for sharing this Christina. When we look at what others had to face, it makes our problems seem small and insignificant. We need these daily reminders in order to persevere during trials. Life has many crooked paths…but with God we can find our way through them. Blessings dear friend!